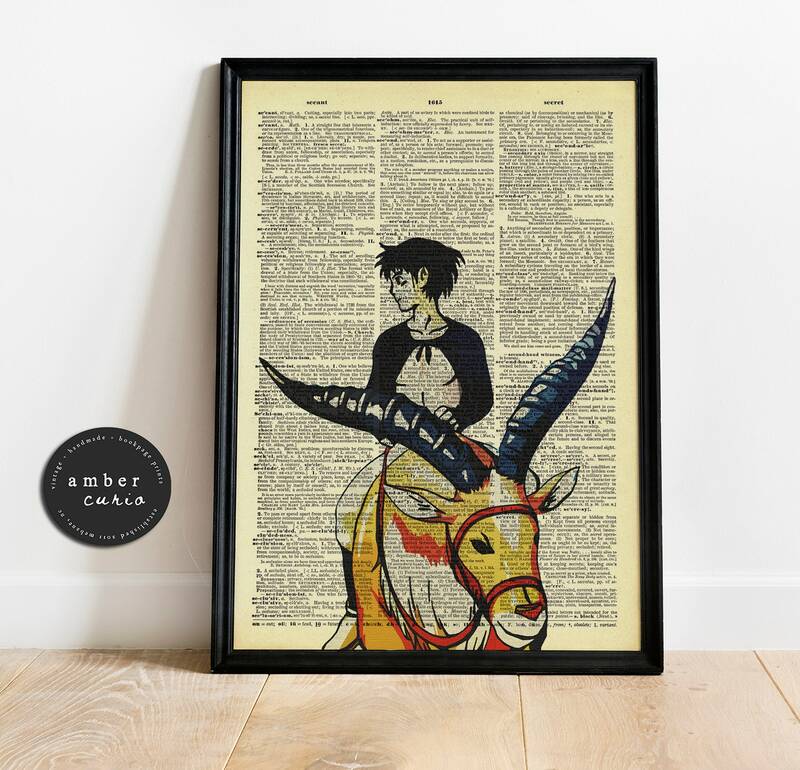 A perfect gift for any Princess Mononoke studio ghibli fan, this Ashitaka and Yakul book page print is printed on a completely unique page. At AmberCurio we have been renewing discarded antique books since 2011. With the up-cycling process we take books that are falling apart and save the pages individually so that they can be used to create new unique art prints. • Unframed - All prints are un-framed, the frames seen in the photos are just an example of what the prints will look like once you pick out your own frame. • Aging - Each page will be 100% unique and will come with its own golden glow from the aging process. These “imperfections” are what make them unique. • Shipping - Prints come in a sturdy stay flat mailer to keep them straight and safe.Packaging - Prints come in a clear archival sleeve to keep them dry. • Material - all book page prints come on authentic up-cycled book pages. Each page is unique and special with our original designs added to them. Please do not buy your 4th free print. In the notes section at checkout please write the full title of the print you would like and it will be included with your order. If you do not pick a 4th print we will assume one is not needed and it will not be included. All 4th Free Prints come on 8x10 Dictionary Paper only. Prints look great. Very nice quality. Beyond cool! I originally came to this shop because of the great art prints they have on old book pages and subsequently saw this little gem. It came beautifully packaged and is just as pretty in person and in great condition. Custom Orders are taken by request. Please click the "Request Custom Order" button on our homepage in order to submit a request. Examples of Custom Orders; Portraits, Quotes, Pet Portraits, Characters (tv/film/book), Names or Dates, Wedding Announcements, Birth Announcements and many more. We will discuss with you the options and what you are looking for, quote you a price and then send you a proof to approve before we create the listing for purchase. Once everything is agreed upon the listing will be up for sale to you only. Not paying once a listing has been created will result in a ban from requesting custom items in the future. Please handle any print purchase very carefully. These prints are at times very delicate due to their antique age. The sooner you put them in a frame the safer they will be. The colors are sometimes a little different on the pages due to the aging of the paper. This means so pages may have more of a golden color than others. Prints come in Approximately the size listed. The size may vary in very few millimeters due to the original printing of the book being off centered. Gift Messages are free and provided at checkout. Please contact me via Etsy Message about any Wholesale options.